Tea chest boxes are suitable for lighter, bulkier items – pots, pans, clothes, toys, linen, cushions, shoes, etc. Large cardboard boxes constructed from heavy duty cardboard . Perfect moving boxes for keeping goods safe during transport or storage. 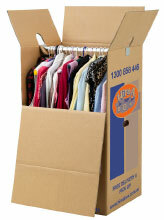 Book carton moving boxes suit heavier items such as books, papers, records, CD’s, DVD’s. Crockery and glassware travel extremely well in these medium moving boxes. Wine bottles, pantry, bathroom and sink cupboard items, tools etc. Portable Wardrobes or Porta-robes make carrying your clothes safe and easy. Protect your best dresses, suits and shirts by keeping them hung up during transport in these purpose built wardrobe storage boxes. What’s the difference between hiring and buying the boxes? Hiring the boxes is cheaper than buying the boxes. You can hire the boxes if you need them for less than 3 months. After the 3 month period, you forfeit the deposit you pay upfront on the moving boxes, and we no longer collect the boxes. When you hire the moving boxes, we drop them off to you and then once you have finished with them, we come and pick them up. Hiring also means you don’t have to worry about disposing of the boxes after you move. We deliver our packing boxes and moving materials in the metro areas of Sydney, Melbourne, Brisbane, Adelaide, Perth and the Gold Coast. If you call up early in the morning, we may be able to deliver the same day, simply ask us and we can check with the driver. Failing that, we should be able to deliver the next day, you simply select a convenient 2 hour delivery window and we will drop them off then. And no, you don’t need to be home when we make the delivery if there is somewhere safe to leave the packing boxes. Can I pick up the boxes? Unfortunately not as we are a delivery-only business. We don’t have a storefront. However, we can generally deliver super-fast – so give us a call on 1300 858 446 to see when we can get the boxes to you. Alternatively, enter your postcode into the section at the top of this page to see the available delivery days and times. Have more questions or want to know more? Continue reading our frequently asked questions. No company is perfect, but we’re proud of our positive reviews. We always aim for constant improvement by acting upon our customers’ honest feedback. Have you used our services? We’d love to hear from you. Thank you very much for the boxes. Rod came at the promised time, the boxes were in great condition and he stayed to provide advice about how to put them together and pack for moving. I would hireabox again without hesitation. What an amazing business.Boxes order at very late notice and they were delivered, with very little time frame, by a really friendly and efficient worker. Then due to an injury I need to get assistance with the pack and used Hire a Packer, the ladies arrived on the dot, rolled up their sleeves and excelled in getting what I needed done. Brilliant and I highly recommend both services to anyone. Excellent service, great communication and the boxes are fantastic quality. I've used Hire a Box for my move and I'm so impressed, I've been recommending to all my friends and family too. I'll definitely be back if I ever need boxes again. Highly recommended. We received the boxes within two hours of ordering and the staff very very friendly and helpful. I used hire a box twice before and was happy with the service so it was a no brainer to use them 6 years later. So far this move I’ve done two orders and deliveries. The delivery lady has been prompt and professional both times. She is friendly and personable, a credit to your business. Even if I don’t return all the boxes it is still cheaper than other companies offer their boxes for. All my boxes were new on delivery. Happy to provide a 5* as these guys are the best around. I plan on using Hire a mover for my move this week and am awaiting on a quote for Hire a Packer as my partner just broke her ankle and can’t do it. I’m in Adelaide moving one suburb to another. I used Hire a Box for a move in Melbourne, hiring ~37 boxes. It was all very easy to order online. Rod who delivered the boxes was fantastic at explaining how it all worked and giving tips on how to treat a hired box so that the deposit would be fully refunded. It's all very basic and common sense. The boxes were a mix of new and used and all in fantastic condition. Rod also collected the boxes. Both for delivery and collection he was on time and attentive. The deposit was refunded very speedily. Fantastic service and would definitely use again. These guys provide an excellent service. You order online at your convenience and they arrive very promptly at the time you pick. You then have the option (if you hire them) to get them picked up once you no longer need them - saves you trying to store them for "future use" or trying to get rid of them yourself!! A wonderful experience so far! I had a set of boxes delivered to my door on a very rainy Adelaide day. The person doing the delivery rang to double check my verandah was under cover (I wasn't home at the time of delivery). Unfortunately I missed her call and I was a bit worried on the way home that they might be getting wet! Fortunately she had stacked the boxes so neatly and tidily on my tiny verandah that they were well out of the weather. The boxes are in great condition. 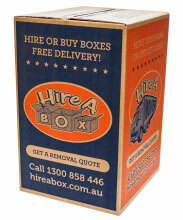 Hire A Box boxes are extremely cost-effective. You generally save around 30% when hiring our packing boxes as opposed to getting them from a removalist or expensive box shop. As we are an online business we don’t have any the expenses of a traditional retail store and hence pass on the savings to our moving customers. Not only are our boxes cheap, our delivery service is ultra-convenient. Our drivers are on the road everyday so if they can’t deliver your moving boxes to you the same day, rest assured you can get them the next day. You can also choose a convenient 2 hour deliver window or choose for us to leave them somewhere safe so you don’t have to sit around waiting all day. We don’t use couriers or Australia Post, our own staff personally deliver your boxes. 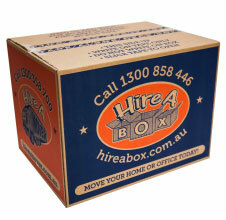 All our packing boxes are made in Australian from superior grade virgin cardboard. This means they don’t fall apart when you fill them up and also last when stacking in the truck or for storage purposes. We don’t sell those flimsy packing boxes many of our competitors sell. Hire A Box are the number 1 choice for hundreds of schools, businesses and government organisations due to the fact that you can hire our moving boxes. We drop them to you, let you keep them for up to 3 months and then collect them once you have finished with them. Not only is it great for the environment, but it is also very convenient as you don’t have to worry about disposing of the boxes. You can also choose to buy new or used boxes if hiring doesn’t suit you. For your convenience. We offer 3 main types of popular boxes for moving – book cartons, tea chest boxes and portable wardrobe boxes. These are perfectly suited for moving home or office as the 3 sizes will fit all the most commonly moved items. We also sell a range of packaging material and special boxes including tape rolls, tape dispensers, butchers paper, tv boxes, mattress and sofa protectors, and a bunch more. Hire A Box also offers a range of other convenient relocation services under the one roof to help make your move easy. We offer cost-effective and professional removal services with Hire A Mover. 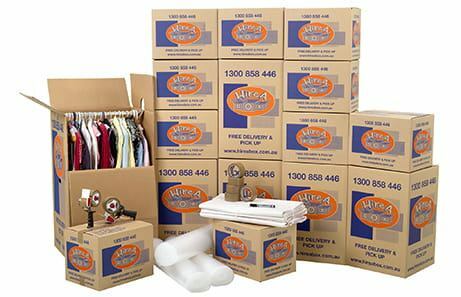 We also offer professional and friendly home and office packing services with Hire A Packer. Check them out and enjoy having one point of contact across all your moving services.